errings National School welcomed a very special visitor to their school on January 21st when INTO President, Emma Dineen, spent some hours visiting classrooms where she met the children and staff. The children sang songs, recited poetry and asked her some very interesting questions about her role in education. Her big chain of office with the 32 medals and insignia intrigued the children. 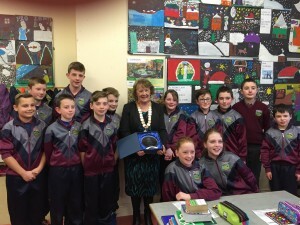 The 6th class pupils presented Emma with a plaque to mark the occasion of her visit to our school. A massive congratulations to the boys and girls in third class who were delighted to hear that they were named Ireland’s Water Explorer School of The Month for January. They received the wonderful prize of a digital camera as a thank you for all their hard work. Water Explorer is a fun, inspiring and educational programme that empowers thousands of students across the world to lead joint action on water issues for their schools and communities. The children from Berrings completed five challenges including creating and performing a ‘Water Rap’. They also carried out a survey to find out how much water is used in the school each day. The school is currently working towards their third Green Flag which is based on the theme of saving water. Best of luck to the boys and girls for the rest of the school year!